Life is busy. We have plenty to do with work, chores, errands, extra-curricular activities, more work, and everything else that we do between getting up in the morning and going to bed at night so we can do it all over again the next day. Making time for ourselves is hard enough, but does that mean that carving time out to read is nearly impossible? There are so many reasons to pick up a book and start leafing through its pages – whether you are the kind of person who needs a physical book that you can dog-ear, write on, or even smell… or the kind of person who loves the simplicity and instant gratification that comes with reading on an electronic device. I’m a bit of both. I am a reader: eternally in love with the way words align on a page, causing us to laugh, cry, sigh, hold our breath, scream, and lean at the edge of our seats awaiting the next move, the next phrase, and the next part of the story. “Reading gives us someplace to go when we have to stay where we are.” – Mason Cooley. Books have the ability to let you grow up, love, and live through whatever wonderful or agonizing moments a character does… it is a transformative event. And although sometimes the words within a page compel you to shed some very real tears, to live that life, even if just for that one moment, is truly a priceless experience. … And that idea, brings me to this next reason: when we read a story that is so well-written and so gripping that it can transport us into another’s soul, you know you’re reading a great book. That’s how I feel about Isabel Allende’s Paula. It is a beautifully written memoir about her daughter’s illness, which eventually led to her death. It is the story of a mother struggling with her inability to save her child. It is a painfully honest recounting of mistakes, of memories, of small triumphs, and of the ultimate defeat in the face of death. Yet, it is also about the strength of moving on, and accepting that we are lucky to have those we love so much around us for whatever amount of time they are there. In short, reading makes life richer. It exercises our imaginations by taking us far away and making us see through different eyes. Reading allows us to live better lives, and to appreciate so many things we have, while also causing us to yearn for fictitious people we desire to meet, and places we wish we could visit. Taking time to read makes us better people, and enhances our perception of what the world can be. So I hope you’ll pick up a book and read tonight, even if just for a little while. Ruth Duran-Chea has been a full-time classroom teacher for the past 10 years, as well as a reader, book-reviewer, jetsetter, doodler, sometimes blogger (www.doodlesandwords.com) and avid daydreamer. When she’s not taming her middle-schoolers in the Bronx or grading papers, you’ll find her curled up on her couch with a good book… unless she’s found a beach to read by, in which case, she’ll definitely be at the beach! I love these quotes! Life can get a bit hectic and make you forget the importance of sitting down and reading. This is a great reminder of just how wonderful reading can be! There are so many wonderful books to read and reread — for just about any reason! 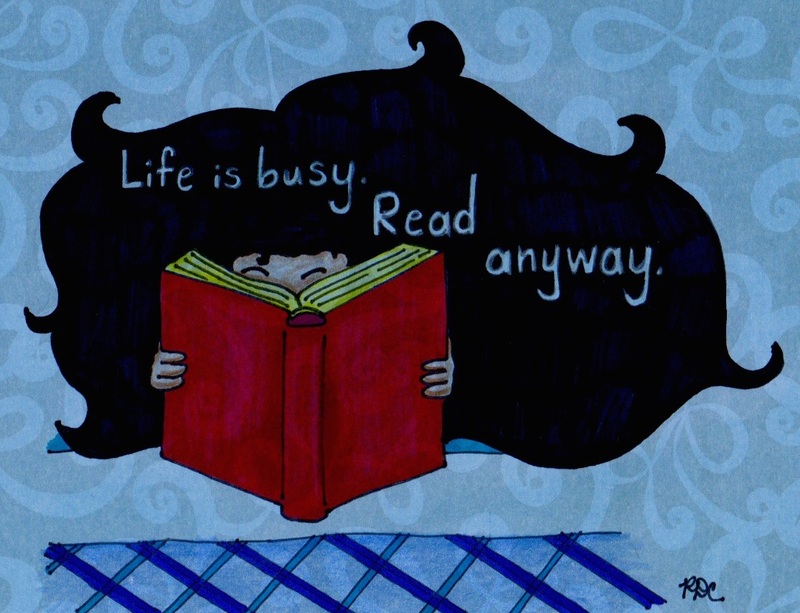 Another one of my favorite quotes: “I was born with a reading list I will never finish” — Maud Casey … and it’s true! So true!! I think the best gift anyone can give is a book. It changes you. Isn’t it?! Books and stories are just amazing… I can’t get enough of them! Wonderful post and I loved all the titles you used as illustration; like you I make time to read and I continue to try to excite others to read for all the reasons in your post! I love reading! My original love of reading caught spark by spending 2 years at St. John’s College. Now I read every day as much as I can. It’s funny how once you become a reader it’s a life-long endeavor — whether it starts at a young age or later on… it’s why I try so hard to get my students to just learn to love stories of any kind, and the reading takes off from there. You’ve inspired me to pick up a book – tonight – no more excuses. Wow this is inspiring. Really good! This is so true! I totally love to read. I’m currently reading Americanah by a Nigerian writer, Chimamanda Ngozi Adichie. Thank you so much for this post! That sounds pretty interesting… reading authors from other countries always adds a new perspective! Books are a sanctuary, Completely agree. & great quotes. I just used your post as a mentor text with my sixth graders. After reflecting on your message with their peers, they each chose a quote which “spoke” to them (either one of those you featured, or an “original”), and wrote a paragraph about how that quote makes a case for the importance of reading in their life by relating it to their own “text evidence.” Thank you for helping to inspire rich discussions in each of my classes! I’m so glad you used it with your sixth graders! My 6th graders and I love quotes… today one of my students said she wanted to hold off on drafting the conclusion to her essay because she wanted to think of a “compelling quote to finish.” It’s funny how others’ words can touch all of us so deeply! Thank you for sharing that with me!